Pebble, everyone’s favorite indie smartwatch maker, looks to be preparing a European sales push after it announced updates that will make its smartwatch app available in French, German and Spanish. Writing last month when it added support for notifications in over 90 languages, the company said its multi-lingual updates will “pave the way for more languages to come in the future, as Pebble steadily lands in more countries around the world”. Pebble already ships worldwide (with an additional $25 shipping fee plus local charges), but its physical retail presence is strongest in the U.S.. Making the product fully localized in these new languages is a logical first stop to increasing the number of offline retail outlets selling its products in Europe and other parts of the world. It looks like the company may also have plans to add Chinese support soon. 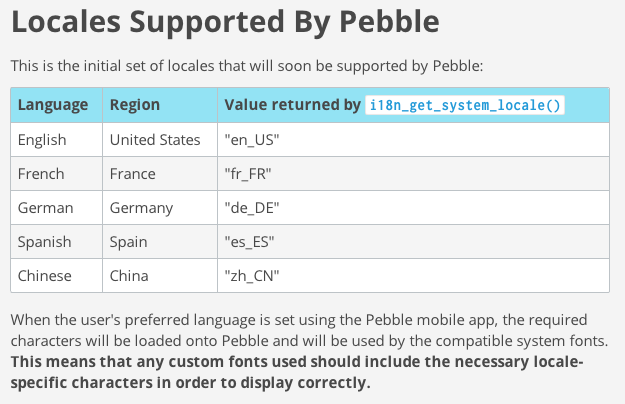 That’s according to a developer document that lists Chinese among the languages supported by Pebble apps. Pebble owners can change the language inside the settings menu of their iOS and Android apps. There’s no word on which other languages will come next and when they will land.